Congregations face a variety of challenges. Technology, building, leadership development, conflict, strategic planning and many more are important issues that Indiana congregations handle every day. The Center has found that blending an excellent outside resource with a congregation’s own ingenuity can strengthen a congregation’s capacity to effectively address their challenges and opportunities. The Center for Congregations works with clergy, staff, laity and members to help them find resources to handle issues revolving around daily congregational life. Center staff listen as these congregational leaders identify the concerns in their faith communities and help them articulate their challenges. Staff then research and identify the resources that best address the congregation’s questions. Resources can be websites, books, articles, videos, organizations, research groups, consultants, publishers, software or even other congregations. Center for Congregations staff connect congregations with resources to help them think critically and plan creatively to address their challenges. Click here to find out more about resources. So how does a congregation take advantage of the Center’s resource consulting work? The first step is to contact the Center for Congregations in your area. There are offices in Crown Point, Evansville, Fort Wayne, Indianapolis and Seymour to serve churches, parishes, synagogues and temples throughout the state. Click here for contact information. The next steps vary, depending on the congregation and its need. They generally include a meeting between the congregation’s core leadership and the Center staff member. This visit helps the Center staffer to learn more about the real needs of the congregation and determine a resource discovery strategy. Once the needs are established, the staff member works on finding the right resources. 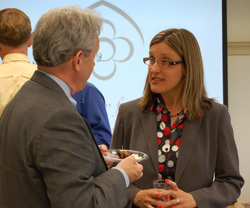 Sometimes there are additional meetings (often via telephone and e-mail, as well as in person) with the clergy and other key leaders to provide feedback and help with identifying and locating the proper resources. Once a resource is recommended, the lines of communication stay open should congregational leaders have questions or concerns. This follow-up support also includes evaluating the congregation’s experience with the recommended resource. The process is a partnership of dialogue, research, learning and reflecting about resources. During this partnership, the congregation itself may discover resources that address its needs – and could prove helpful to other congregations in the future. That is one way that this partnership extends into the wider faith community and provides a “resource trust,” enriching and strengthening many congregations in the state. Whatever the need, the Center for Congregations is available and ready to work with Indiana congregations to address their challenges and opportunities.